It is common knowledge that the KwaZulu-Natal North coast is experiencing significant drought and it is during times like these that we need to endeavour to conserve our water and protect our land to the best of our ability.We at Emdoneni Lodge would like to encourage everyone to do all that is in their power to save our water and protect both the land and the wildlife affected by the recent droughts and it is so encouraging to hear of all the systems set in place in order to help combat the effects of the drought on the coast. The iSimangaliso (meaning miracle and wander) Wetland Park is a well-known heritage sight here on our South African coastline. The Wetland provides many a wildlife with a place of safety and source of water and food. The Wetland Park is 332 000 hectares in size and houses 3 major lake systems, 8 interlinking ecosystems; 700 year old fishing traditions; most of SA’s remaining swamp forests Africa’s largest estuarine system’ 526 bird species and 25 000 year old coastal dunes – some of which are among the highest in the world which is why it is imperative to us to conserve the land and protect it – as well as any other areas that are being negatively affected – from the effects of the on-going drought in the area. Currently, there is a beach spillway in place that will transfer any water flows from the Umfolozi catchment through to Lake St Lucia as soon as the Umfolozi river flow increases. The tender that was put together to remove portions of the dredge spoil pile that was placed in the mouth of the Lake St Lucia estuary is in an advanced stage. We are pleased that the funding has been secured and contractors are expected to commence with the site establishment and development in the early parts of the New Year (2016). The aim of this tender or process you may ask? The intervention mentioned above will contribute to the hydrological and estuarine restoration of the Lake St Lucia system and wetland by encouraging the link between the Umfolozi River and the lake and making this link a more stable one. 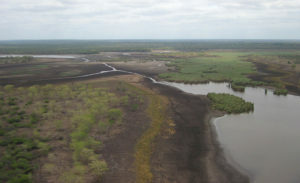 Research has indicated that with some of the land removed and the increased stability in the connection to the Umfolozi, the mouth of the estuary will become more open more often then closed. Breaching the Lake St Lucia’s estuary mouth in an artificial manner as a quick fix is most certainly not viable. Although it may seem like a temporary solution, it would increase the amount of salt loading an worsen the sanitary situation. Furthermore, without substantial freshwater flows, the mouth would be most likely to close soon after being artificially opened or breached, as sand would be driven into the estuary from the sea along with high levels of salt. If limits of tolerance of the normal estuarine invertebrate fauna is reached it could also cause significant negative long term impacts on fauna.